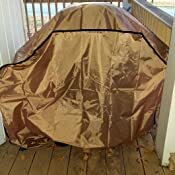 Our grill lives on our front porch year-round due to lack of storage space, which isn't ideal when you live in an area that gets a lot of precipitation, so I thought this grill cover would be a good idea to protect our grill from the elements. 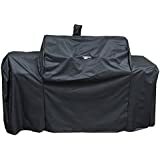 I ordered the large size grill cover, which is more than big enough for my older, standard-sized Charbroil grill that measures approximately 40 inches tall by 40 inches wide. It would easily completely cover a much larger grill. This is a thinner, lighter weight material than other covers I've seen – it's not a heavy canvas type of fabric. Yet it's also quite durable, it doesn't seem likely to rip or tear. The lighter material made it easy for me to cover my grill without any help. 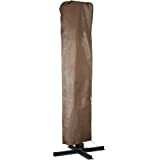 (I have heavier canvas covers for our outdoor furniture and it's a little bit of a struggle to maneuver those over the chairs and loveseat without assistance just because of the weight and stiffness of the material). It rained a couple of days after I received the cover, and the water just beaded up on the surface; my grill underneath was completely dry when I checked. The cord around the bottom has a ball-style clasp so you can tighten and "lock" the cover around the bottom of your grill. 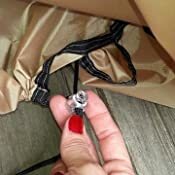 (The material is lightweight enough that it WILL blow around quite a bit on a windy day if you don't have that cord tightened up and secured around the bottom of your grill). I've been using this cover for over a week now, through two pretty windy rainstorms, and haven't had any issues with the cover letting moisture through or blowing around (again, as long as the cord around the bottom is properly tightened and secured – I didn't have it tightened at first and it "puffed up" when it got window, but didn't come off). Overall, I'm pleased with the quality and performance of this cover and expect it will serve its purpose well. I received this product free in exchange for my honest review; all opinions are my own. 4.0 out of 5 starsTaking a chance paid off with this one! 2 Year UPDATE: The Quality of the nylon itself, seam stitching, etc, all held up well thru several hail and thunder storms the past 2 years. However, when it rains moderate to heavy, it does soak thru to grill. Being as lightweight as it is tho, it also dries super fast (but not waterproof... so only water resistant in light rain). Unfortunately, my partner did catch it on corner of my grill when pulling it off recently (and yanked hard vs checking what it was caught on), so ripped in noticeable spot & I decided to replace (however, I blame user error vs grill cover). I did decide to try a thicker cover this time for more protection from soaking rains, and just got it (Andarm- and Very heavy, indeed, especially compared to this one, but I'll post review soon, and update if any issues). With that said, I love the way this Abba one looked, and absolutely would have purchased again if I lived in more moderate climate with less heavy rains. It was light weight, easy to take on and off (Much easier than heavy ones! ), easy to tighten (never once slipped off, even in storm that blew so hard chairs flipped over and slid across deck), and it would have lasted lot longer if hadn't been yanked off when cord got caught on tank). There was also very little fading after 2 harsh years of Nebraska weather (and not really noticeable due to light color, which is why I prefer light covers!). Hope this helps! I was a bit nervous purchasing this as there were no reviews, but based on looks alone, I'm very happy. It is Very thin so only time will tell if the product craftsmanship holds up well in harsh weather (Nebraska weather is not the kindest!). 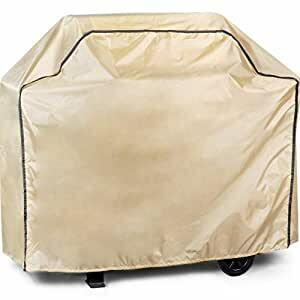 I love lighter color grill covers (black ones fade Super Fast! 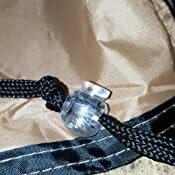 ), and I also buy mine on the large side (easier to put on & off without too much trouble and/or risk of tearing), and this one has easy-to-use push-ties to tighten at both sides on the bottom to keep it on tight. Arrived fast, loved the price, and I will considering buying from them again if it holds up as well as it appears it will. 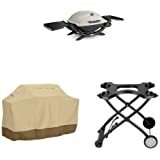 4.0 out of 5 starsWant a heavy duty grill cover with a resonable cost that will actually last? My husband has a charcoal smoker barrel grill and this one fits perfectly. Thr material on this Abba Patio grill cover is water resisted and the best part is that it's not super cheaply made. Meaning I know it will last for a long time to come. 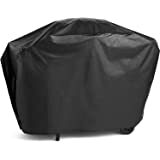 Being IN Florida and dealing with the super humidity and tumoulterous rain storms, this cover will inevitably prolong the life of my husband's grill. I did recieve this item with a reduction in cost in exchange for my personal and unbiased opinion. Would not recommend. I bought this in April and now (November) it is sun bleached, very thin, does not keep water out, and does not stay tight enough to not blow away in windy weather. After spending 8 months sitting outside, I was hoping that the color wouldn't have faded; not the case. The top has become almost white. As time has gone on, the material itself has gotten very thin and fragile. The material on the top, ripped when snagged on something and the rear will spread with more time. My area doesn't get monsoon weather but we get a few good soakings in the summer. From the very beginning, this grill cover didn't keep heavy rain out. My area gets a lot of wind during the day and from storms. I started using bungee cords to keep the grill cover attached because it would routinely fly off. Product is indeed very large so it will fit a variety of grills. The cover is very, very thin. Don't expect a good quality from this. Even with the drawstrings pulled all the way, my grill cover still blew off in the wind. Easily washed and stored. While the cover fits over my grill it doesn't tend to stay on well in wind. I have used the clasp as design and it doesn't have staying power against the strain of the wind. I have also tried tying the string to the grill without any luck. 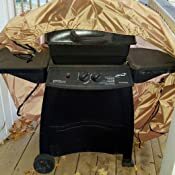 Now that my grill as been exposed for and is starting to rust I am planning on getting a heavier grill cover that I can attach weights once I buy a new grill next season.